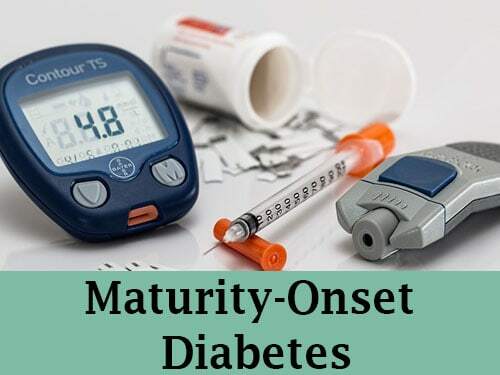 Maturity-onset diabetes of the young or MODY is considered by many physicians and researchers to be a subset of Type 2 diabetes (T2D) and is often misdiagnosed as T2D. Some estimates are that over 90% of MODY patients are misdiagnosed as having T2D because many physicians are not aware of the distinctions. About 1-2% of all diabetes cases can be considered MODY. The terminology currently used can be confusing because MODY and T2D are very similar and the distinctions are still being studied. For example, there are least six different genes that when mutated or damaged can cause a form of MODY. However, only three are officially recognized as forms of MODY (MODY1, MODY2 and MODY3—see below). The others are not universally recognized. There are some distinct characteristics of MODY that can differentiate it from other forms of diabetes, but these are not often recognized as well because of the rarity of the conditions. These distinctions can be important because the different types of MODY respond better to different treatments. HNF4A (MODY1): This is the gene that codes for a protein known as Hepatocyte Nuclear Factor-4 Alpha gene. The protein produced by this gene switches other genes on and off. Babies with this mutation are often born with macrosomia—they are larger than normal (over 9 pounds). They also may have low blood sugar early in life. Adults may not show any symptoms until middle age or later, but will require some form of blood sugar control—either by using insulin or medications which control blood sugar levels. Glucokinase (MODY2): Glucokinase is responsible for parts of glucose metabolism—how the body uses glucose. If the glucokinase gene is damaged, it does not produce enough glucokinase and the levels of blood glucose (blood sugar) will increase. This form of MODY is relatively mild and is often only diagnosed during routine screening. However, this form of MODY can be significant during pregnancy. If this type of diabetes is diagnosed during pregnancy, insulin may be given, though not all physicians will prescribe insulin, preferring “watchful waiting” and increased monitoring of both the mother and the fetus. HFN1A (MODY3): This is the gene that codes for a protein known as Hepatic Nuclear Factor 1 Alpha. Mutations in this gene lowers the amount of insulin produced by the pancreas. A change in this gene is the most common cause of MODY3, representing about 70% of all MODY cases. IPF1 (MODY4): Insulin Promotor Factor 1 (IPF1) is also known asPDX-1, and is a gene that is involved in the growth and development of the pancreatic beta cells. It is also involved with supporting the activation of the gene coding for insulin. HFN1B (MODY5): This is the gene that codes for a protein known as Hepatocyte Nuclear Factor-1 Beta. Mutations in this gene cause a form of MODY associated with the formation of kidney cysts along with diabetes. Individuals with a mutation in the HFN1B gene are often seen not because of symptoms of diabetes, but because of the formation of renal cysts, genital tract anatomic malformations and high levels of uric acid in the blood—this can result in gout, even in very young children. The MODY or diabetes diagnosis often comes later. NEUROD1 (MODY6): This is the gene that codes for Neurogenic Differentiation 1, a protein that allows for the production of proteins from other genes. NEUROD1 regulates the expression of the insulin gene—when it is damaged, less insulin is produced. There are a number of other genes that have been suggested cause MODY, but there is not universal agreement about these genes. MODY is different from both T2D and T1D. The following table lists some of the most important differences. Can it be inherited Yes—MODY can be passed on to children. One of the key features of MODY is a parent and a grandparent with diabetes Not completely– the risk of T2D is passed on to children. Also dependent on environmental factors. Not completely—the risk of T1D is passed on to children. Also dependent on environmental factors. In general, the diagnosis of MODY requires genetic testing. This usually means a blood test and can take from 4-8 weeks for the results to be returned. In some cases, that time can be much shorter. Less commonly, a mouth swab can be taken for genetic testing. Otherwise, for the most part, MODY is often discovered during routine screening for blood sugar levels. The symptoms of MODY are often quite mild. As mentioned, MODY is often discovered during routine testing. The symptoms of MODY, if they appear, are similar to the earlier symptoms of diabetes—increased thirst and urination, unexplained weight gain, slow healing and frequent infections though these symptoms may be mild enough to go unnoticed. HNF4A (MODY1): Usually responds well to oral medication with sulfonylureas. The sulphonylureas include drugs like glyburide (Micronase®, Diabeta®, Glynase®), glipizide (Glucotrol®) and glimepiride (Amaryl®). The sulfonylureas are the oldest class of diabetes medication and function by stimulating the pancreas to produce more insulin. Treatment with these medications can delay the need to inject insulin, but insulin will sometimes be needed as well to gain full control. Glucokinase (MODY2): This is a milder form of diabetes and often goes untreated with either medication or insulin, with the exception of during pregnancy, where greater monitoring is often needed. MODY2 patients can often do very well by managing their diets and getting exercise. HFN1A (MODY3): People with this form of MODY respond well to treatment with a class of diabetes drug called the sulphonylureas. Treatment with these medications can delay the need to inject insulin. IPF1 (MODY4): MODY4 patients usually respond well to sulfonylureas as well. MODY5 and MODY6 as well as the rarer forms of MODY commonly need insulin treatment, sometimes soon after diagnosis. In MODY5, the kidney cysts and other disorders must also be treated. Other than MODY 2, all forms of MODY carry risks of the same complications (nerve damage, eye involvement, heart disease, kidney disease) that T1D and T2D have, so control of blood sugar is critically important.